Graham Patrick Martin was born in Thibodaux, La. He attended French Woods Festival for the Performing Arts in Hancock, N.Y., in the summer of 2000, where he first appeared on stage as Louis in The King and I. Back in Louisiana, Martin signed up for an after-school drama program and performed lead roles in such productions as Charlie and the Chocolate Factory, Huckleberry Finn and William Shakespeare’s A Midsummer Night’s Dream. While participating in the program, he went on to perform in four other Shakespeare plays. In 2003, Martin auditioned for his first professional stage role and was cast as Young Ebenezer and Cratchit Child #2 in Christopher Durang’s Mrs. Bob Cratchit’s Wild Christmas Binge, for which he was nominated for Best Performance by a Child Actor Award at the 2004 Big Easy Awards. In 2004, he played the role of Chips in Tennessee Williams’ A House Not Meant to Stand. Martin has performed in more than 24 stage productions, landing lead roles as Danny Zuko in Grease, Bugsy in Bugsy Malone, Nathan Detroit in Guys and Dolls and other featured roles like Rum-Tum Tugger in Cats, Young Joe Hardy in Damn Yankees, Bill Sykes in Oliver and Kenny in Fuddy Meers. Martin made his feature film debut in Jack Ketchum’s Girl Next Door and has guest-starred on such series as Law and Order: Criminal Intent, iCarly, Jonas, Good Luck Charlie and Love Bites. 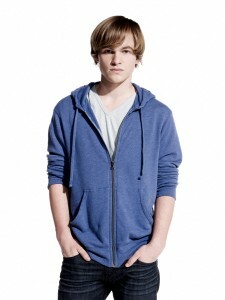 He earned a Young Artist Award for his performance on the TBS sitcom The Bill Engvall Show. He has also played a recurring role in Two and A Half Men and was a series regular in Monster of the House.